Former President, Donald Ramotar on Sunday defended his decision to sign a zero royalty agreement with CGX Energy that also contains provisions that mirror those in the controversial ExxonMobil agreement inked by the David Granger-led administration. However Ramotar, who was President from 2011 to 2015, said he inked the agreement with CGX because of the need to attract oil and gas investors to a country that had for decades failed to find crude oil in commercial quantities. “It was signed at a time when oil was not discovered in our country and it followed a format that was there since the mid-80s, I think. There was a standard kind of an agreement that was modified in the 90s, but you have to recall that nobody found oil and we were trying to encourage people to look for oil at the then time,” Ramotar told Demerara Waves Online News. Among the contentious clauses in both the ExxonMobil and CGX Energy Production Sharing Agreements are a permanent cap on all tax exemptions that effectively bar government from imposing new or additional charges even if laws are amended to provide for increased or new taxes. Ramotar brushed off questions about whether criticisms of the 2016 contract between the Guyana government and the Exxon-controlled Esso Exploration and Production Guyana Limited are justified. “I think the major difference now is that we know how much oil is out there- at least we have some idea of the oil that is out there and it is substantial- and I think that the criticism that the PPP has been making,” he said. The 69-page CGX Energy agreement stipulates that there should be a 53 percent share of profit oil and profit gas, and 47 percent will be retained by that Canada-headquartered company. The agreement caters fora one percent subsumed royalty to be paid by the government to the State’s coffers which in effect means that the company would not be paying. The ExxonMobil agreement, on the other hand, provides for the company to pay 2 percent royalty to Guyana, 75 percent cost oil and 25 percent profit oil to be split equally between government and the company. Ramotar said he did not sign anything different from other Presidents or give any “extra concessions”. Asked why he did not seek to strike the best deal ever just in case CGX had struck oil in commercial quantities, Ramotar insisted that Guyana was not an attractive place for oil companies. Ramotar said those who crafted the CGX Energy Production Sharing Agreement were drawn from the Ministry of Natural Resources and the Guyana Geology and Mines Commission (GGMC). 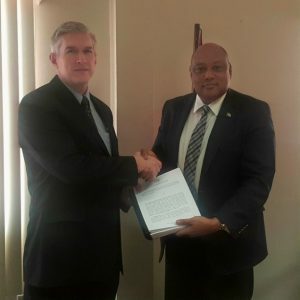 Now that the Guyana offshore oil basin has been de-risked and ExxonMobil continues to find oil in commercial quantities, the former Guyanese leader favours a renegotiation of all those contracts that provide low returns from the oil and gas sector. In that regard, Ramotar would like to see government and the opposition jointly agreeing in Parliament for the agreements to be renegotiated, but he opted to leave any details of such a move to the current parliamentarians of the opposition People’s Progressive Party Civic (PPPC). “Why not? Any agreement that you can renegotiate now, with the knowledge that you have, sure you should grab for it…Now, it’s a different kettle of fish, it’s a different ball game and if the government can renegotiate things with the knowledge that they have, then we can be in a better position,” he said. ExxonMobil estimates that its current proven reserves offshore Guyana are about 3.2 billion barrels and it is likely that, with more discoveries, production will eventually be about 450,000 barrels per day. The company plans to add another Floating Production, Storage and Offloading (FPSO) to ramp up daily output. The former President said he would support a bipartisan approach because that would put a Guyana in a much stronger position. 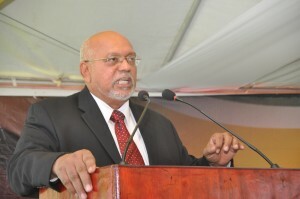 In the wake of persistent criticism of the ExxonMobil deal on the grounds that the two percent royalty on gross production was low compared to global standards, Minister of Natural Resources, Raphael Trotman has justified the provisions of that contract saying that political, border security and financial risks were also factored. In addition to the two percent royalty, government has said that it was able to clinch increases in annual rental fees from US$240,000 to US$1 million, training funds from US$45,000 to US$300,000 annually and a new provision for US$300,000 for social and environmental programmes.